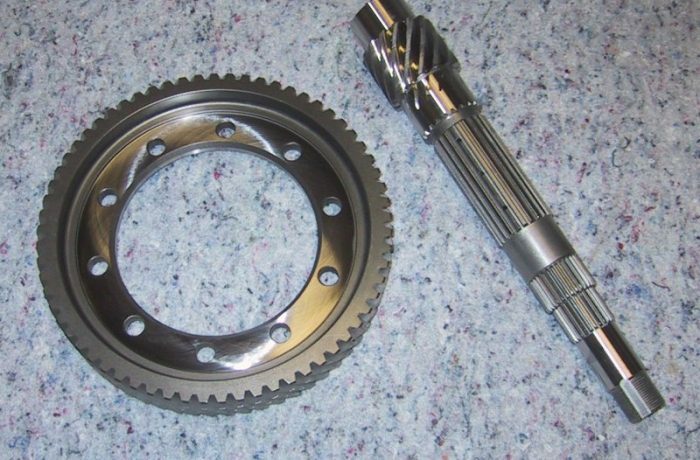 These gears were developed to meet a growing demand for a higher numerical ratio final drive gear for the growing Honda F and H series front-wheel drive transaxle. In addition to achieving a higher numerical ratio, the product needed to withstand the high-torque requirements of fully built race engines operating with much wider tires in a competitive (track racing) environment. This resulted in a need to support 2 to 3x the torque of the factory motor. Several prototypes were made, put into service, and then torn down for analysis. After thorough testing on-track, improvements were made to the design, which was then released under the manufacturer’s own private label and sold to the general public.